In Operate, it is possible to set up rules that will automatically assign leads to different users depending upon specific criteria you set. This is helpful if you have different people handling leads for different types of enquiries or for different locations, or both! Auto Assignment will work whether the lead is entered manually, received through leadDADI or submitted from your website using Web to Lead. To create a new auto assignment, go to Settings > Customize > Leads > Auto Assignments and click the New button a the top of the list of any pre-existing assignments. Operate only allows one Auto Assignment to be active, therefore if you create and activate a second one, the existing Auto Assignment record will be deactivated. To create detailed configurations, we recommend using the Rules (explained below), where you can set up a wide variety of filters according to which your assignments will be made. Please only use this area to assign your leads - you can use multiple rules of the one assignment record that can be active at a time, to create complex assignments using different filters and assignees. Creating additional workflows may cause your assignments to stop working, due to potential filter overlap. This is an aspect to be cautious about when creating your assignment rules as well - if you have multiple rules, please do not use the same exact filter on more than one. This can confuse the system and one or more assignments may stop working. You will now be taken back to the list of auto-assignments. Click the name of the one you have just created in order to continue. Do not click the pencil to edit it; simply click the name link. Once you have reached the assignment details screen, you will see the basic information that you have just added; along with system information and a Rules section, where you can choose how your new assignment behaves. 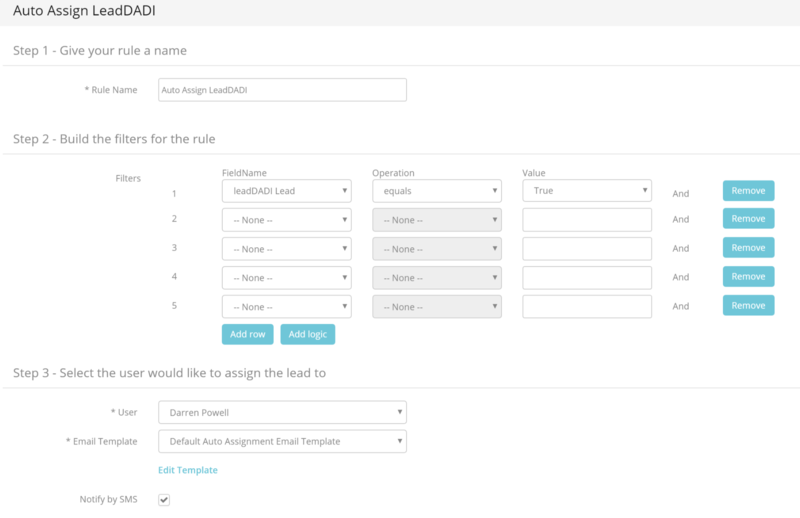 Let’s set up a rule that will assign all leads coming from LeadDADI to a specific user/member of our organization. Here is where you can add different filters that will restrict your auto response to a set of criteria. You can apply as many criteria for the assignment as you need using the filters. Just click on 'Add new filter row' if you want to add more than 5. Note: When creating multiple assignment rules, please be careful not to use the same exact filter in more than one rule. This ca confuse the system so one or more of the assignments in question may stop working. Click Save (top left of the screen) and then click on New to add as many rules as you need. You can see all the auto assignment rules that you have created in a list. By default, they appear in the order that they were created but you can rearrange the order in which they are applied and executed by simply clicking dragging the rules above and below each other.